Expedited delivery is available for all packages. For expedited orders, please send them separately from regular order imports. FAX or email is a good way to let us know to expedite a package. See chart below for rates. Download the Chart if you'd like to include it on your web site or mailing. In order to ship any of our regular gifts to Alaska, the only option is to send them USPS Priority Mail. It's expensive, and there are frequent arrival quality issues because it takes about 10-14 days to be delivered. A much better choice is to hand pack the fruit into a USPS "Large Flat Rate Box", which holds about 15 lbs of fruit -- roughly the size of a Jumbo Tray. 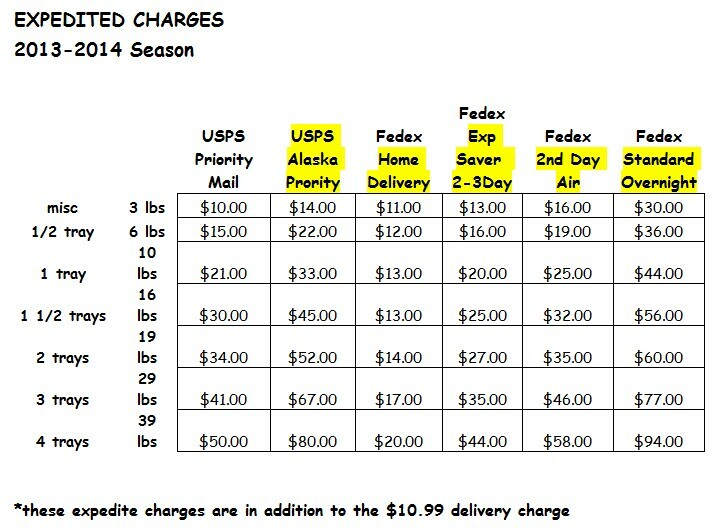 With Flat Rate Boxes, the cost is the same as anywhere else in the country (the "if it fits, it ships" deal), and arrival is guaranteed in 2-3 days anywhere in the country -- including Alaska! It works! We've had excellent results over the years, so we do everything possible to convince the sender to utilize this method. If they want more fruit, send more Large Flat Rate Boxes -- it's still less expensive than sending large packages Priority Mail, and the arrivals are excellent. If you choose this option, we will ship the Flat Rate Boxes at the Jumbo Tray price with no added shipping charge! Send the Alaska orders separately, please.